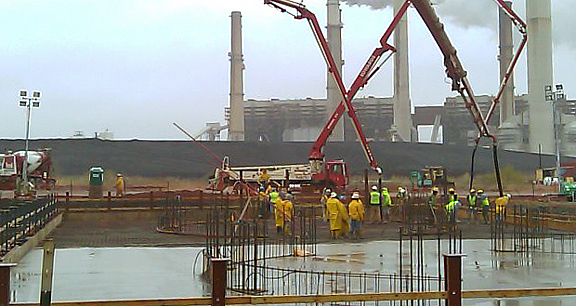 Project obstacles and solutions: The Duke Energy Gibson Station is a dry fly ash conversion facility. Bowen Engineering was contracted to build a foundation for the plant's silos. This required 2,756 yards of concrete. To meet critical deadlines, the concrete needed to be delivered and finished in a matter of 13 hours. IMI used 35 mixer trucks to keep the ready mix concrete supply flowing during this pour. This required over 300 deliveries. This project used three concrete pumps. It was crucial that the concrete be engineered to pump smoothly. A clogged pump would be a serious impediment to meeting this type of deadline. IMI was able to deliver consistent slumps to specification from one truck to the other. At the end of the day, IMI had delivered an average of over 230 yards of concrete per hour. This project won a 2012 Short Course Award for the Commercial/Industrial Concrete category from the Indiana Ready Mix Concrete Association. Take a look at Phase 2 of this project. Click here.